Here is your Baja Report for the 03/08/2010. Enjoy and feel free to submit your own Baja Report; a report can be anything anything related to Baja. 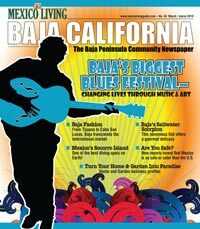 Depending on the date provided, your Baja Report may be included in Mexico Living's weekly Baja Report or the monthly Baja California Guide. SUBMIT YOUR BAJA REPORT: Email reports to bajareport@gmail.com. LOS BARRILES - Theatrical Production: "The Knight of the Mighty Rod".